The combination of a thin book and a thick site make the Allowance Magic experience like no other. The AM site includes a wealth of information about the book, allowances and other important aspects of financial education. The explanations, insights and tools are distributed over both a public and private "Members Only" area. The public area encompases all the ins and outs of the program. The private area provides additional online tools to execute and administer the AM program. The headings for each section are displayed in the index above. Below is a listing that includes all their subheadings and a brief description of what's covered on each page. To go directly to the description of a specific page, simply click on that heading in the index above. To go directly to that page, click on the heading or subheading below or in the Nav Bar to the left. There's no place like it. You'll start here and come back often to visit. Membership has its privleges and that's certainly the case with Allowance Magic. Members have access to a complete package of online tools that allow them to execute and administer every aspect of the program from planning to implementation to follow up. Plan your program and set your parameters. Give your kids the online tools they need to make the most of it. It's all here! Plan your spending. Set your saving and sharing goals. Track your progress and revise your plans. It's all here! Take the online edition for a test drive. See how little it takes to get all these phenominal tools. Parents have their own objectives and challenges. These pages present the information needed to make the most of them. Everything you need to know is in the first eight pages of Allowance Magic. You can review the highlights here in a few minutes and read the entire book in less than an hour. The Potion is the key to the success of your program. Here you can gain some insight into this essential area. 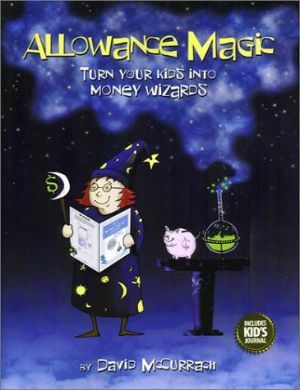 Review the challenges your kids face on the road to becoming Money Wizards. Learn what you can do to refine that process and help them achieve that status. Looking for an edge? Got one to share? This is the place. Join the fray in wrestling with the tough issues of kids and money. Need a little nudge to get you going? This page will help. Have a heart-warming story to share? This is the place. Something not working out like you think it should? Have a problem you can't get past? Check here. If someone hasn't already addressed it, submit it yourself. Gain insights from some of the most well-known sources. Review thumbnails from popular books. Read first-hand accounts of true-life experiences. Check out the tabulation of thousands responses. What's really important in terms of your children's financial education? Join the hundreds who've already set their priorities. Got a favorite piggy bank? Here's a place to share it with the world. Tell us what you think of the book and read what others have to say. Tell us what you think of the site and read what others have to say. This is going to be more work for kids than for their parents. These pages help them prepare and persist. Your special pages where you can dream about what you'd like and then figure out how to get it. What's really important in terms of your financial education? Join the hundreds who've already set their priorities. AM Groups Let the good times roll. Share Allowance Magic with everyone - from your Sunday School class to a group of prospective clients. We've got the program just for you. Get your group talking about this vital issue. We make it easy and economical. Use this presentation as a tool to attract and retain clients. Differentiate yourself from the competition. We've got everything you need. Access incredible online tools - login to your account, develop plans, set goals and update your progress. Become an insider with email updates on events, enhancements, news, tips, appearances and more. Reading and using Allowance Magic is a journey with more than its share of ups and downs. Here's some ideas to help you smooth out the rought spots. Learn the objectives of the program and how they are achieved. Discover the support and tools available for parents and for kids. Take a peak at what we give you to work with in the book. Check out these sites for more information to help you begin and refine the various aspects of your allowance program. We're frequently doing interviews and otherwise getting noticed. See where Allowance Magic has been making news. Just a couple of clicks and the book will be on its way. You won't want to miss this treasure trove of information from experts, parents and kids. Find all you need to foster financial education in your home and community. Everything allowance - from books to banks to games to toys. This store is one of a kind. The preeminent Net source for books and products that help parents teach and kids learn about money and money management. Monopoly is in a world of its own and now it has a store of its own. Here you'll find everything Monopoly - from games to accessories to collectibles. Meet the man behind the magic. Get to know this mystical character. He came, he saw, he attempts to conquer. Relive the journey that lead to Allowance Magic. Here today, gone tomorrow. Learn where David McCurrach is appearing next. Just the facts...and a little bit more. Confused by our constant use of abbreviations? This should help clear the fog. We respect your privacy and will go to great lengths to protect it. Read all about it here. © Copyright 2004 by David McCurrach. All rights reserved. Revised 7/4/04.